PUBLIC authorities have been urged to do more to combat incitement to hatred in Northern Ireland in a new report which questions conviction rates for the crime since legislation was first introduced nearly 50 years ago. Research published today and commissioned by the Equality Coalition - which represents over 80 non-governmental organisations focussed on promoting equality – claims the current approach is “not working” and falls short of international standards. The new report accuses the state of tolerating incidents of incitement and says the current legislation in place, which was introduced in 1987, “does nothing to regulate public authorities” when they fund activities which others then use as a platform for incitement to hatred. Authored by researcher and academic Dr Robbie McVeigh, it highlights the low level of convictions since laws to address the offence were first enacted in 1970. One example raised in the report, which was considered a landmark case at the time, relates to the display of racist material on an eleventh night bonfire in Antrim in 2014. It adds: “Many expressions might be regarded as incitement to hatred in the context of international human rights standards. For example, it would be difficult to regard at least some of the use of flags, bonfires and parades as examples of ‘stirring up’ hatred in the sense identified in legislation. Dr McVeigh obtained statistics from the Police Service of Northern Ireland (PSNI) which show officers arrested 91 people under inciting hatred legislation between January 2006 and December 2016, of which 42 were charged. The Public Prosecution Service declined to comment on the findings but told The Detail it has recommended 26 people be prosecuted under the legislation since January 2011, of which 14 resulted in convictions. These related to offences concerning the use of words or behaviour or display of written material, and the publishing or distributing of written material. Dr McVeigh has called for better recording of such cases and said this should be a focus of a Department of Justice review of the legislation which commenced before the collapse of Stormont in January. Reacting to the findings, Detective Chief Inspector Gary Reid told The Detail: “The PSNI seek to prosecute in all cases where evidence of a hate crime exists however it is often the case that the evidence does not meet the threshold for prosecution. INCITING HATRED OR FREE SPEECH? Should freedom of speech be curbed to protect the rights of others? Incidents that can be perceived as incitement to hatred by some can be defended by others advocating freedom of speech, the Equality Coalition study found. The offence of incitement to hatred is covered by part III of the Public Order (Northern Ireland) Order 1987 which defines it as “acts intended or likely to stir up hatred or arouse fear”. Dr McVeigh’s report found that often other laws are used to bring prosecutions for incidents that some might describe as inciting hatred and asks why the relevant legislation is not used more often. It lists examples of high profile incidents and makes proposals for reform which could tackle incitement to hatred. These include not confusing incitement to hatred with other forms of hate crime or hate speech, establishing clear guidance on what public authorities will tolerate, and to adopt a zero-tolerance approach when it does happen. The study also calls for an end to “the current ‘buck-passing’ between different agencies” who should instead work together to immediately remove any displays of incitement, and says public funds should not be “used by or for activities and organisations that involve incitement to hatred”. 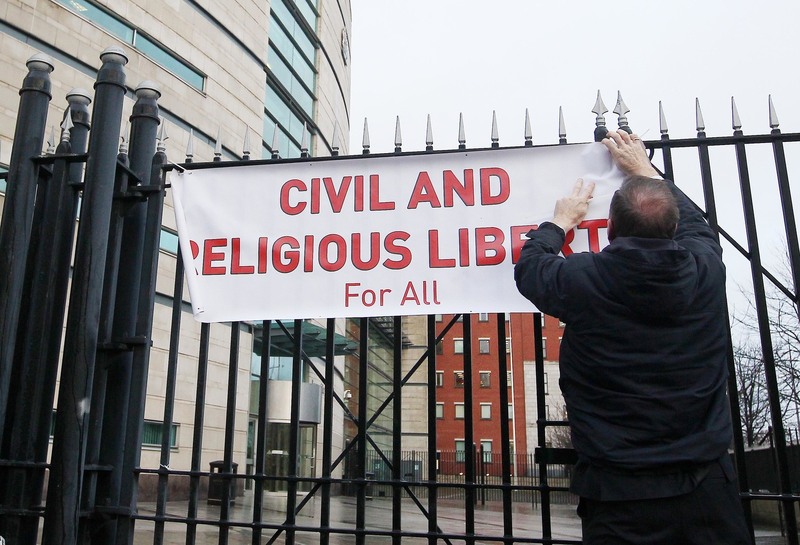 The research was launched today at a conference organised by the Equality Coalition and the George Mitchell Institute at Queen’s University, Belfast.